Who doesn’t need a fix of caveman-ish Blackened Thrash sometimes? Not that I’m an old-school headbanger who thinks that more than three riffs in a song are an offence against the Metal faith, but I enjoy some brutish, primitive metal like CELTIC FROST, HELLHAMER, or more obscure bands like ROOT (in their beginnings) or TORR (whom Fenriz of DARKTHRONE fame once hilariously called “unintentional Black Metal” on his podcast). I also love to find underrated albums form the past, and here on Metal Temple we review reissues (it’s not the rule on Metal sites as far as I can tell), so I get the chance to do exactly that. Reissues can be a hit or miss, so let’s see how has this album aged. USURPER are a US Blackened Thrash band from Chicago that was active between 1993 and 2007, and reformed in 2015. Since then they’ve recorded a new album and are reissuing their discography. “Skeletal Season” is their sophomore album that came out four years after their 1995 debut “Diabolosis…”. 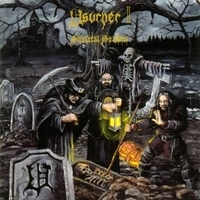 The album cover is a bit goofy depiction of (perhaps) a grave robbery, but the music is more serious and badass. USURPER surely owe a great debt to CELTIC FROST: the heavy riffs with lots of groove and the Tom G. Warrior vocal style are very much CF inspired (even that boisterous “ough” gets thrown in from time to time). But they also incorporate Second Wave Black Metal influences as well as Doom riffs. The album is forty minutes long with 8 songs of various length (from three to seven minutes long). The opener “Shadowfields” starts with and raw and cold sounding Second Wave Black Metal riff and fast, monotonous drumming, this section has the cold sound typical for DARKTHRONE but also the rawness and aggression of MAYHEM; after a while the tempo slows down and the rest of the song is a kind of primitive, boisterous CELTIC FROST-style Blackened Thrash with a heavy groove and Tom G. Warrior-style vocals and shouts. The following song “Dismal Wings of Terror” also starts with typical Black Metal riffing, drumming and high-pitched screams but the following section has a caveman-ish riff and heavy groove. The song has a bridge too which is followed by a section with a super heavy Doom riffs and deep, barbaric growls. The title song has Doom sections sandwitched between heavy, groovy, caveman riffs, and has a creepy atmospheric section with a clean guitar melody. The following song “Embrace of the Dead,” is even more plodding than the one before, it doesn’t seem to go anywhere except some solos and heavier grooves at the end. After that comes “Prowling Death” a fast and Thrash-y song, a welcome change in tempo. I quite like the seven minutes long “Cemetarian”. The chorus is with backing vocals and acoustic guitar is more layered, with a bit of a KING DIAMOND vibe going on. “Brimstone Fist” is a short Blackened Thrash barn burner, with some fast picked Black Metal riffs thrown in for good measure. The album closes with the mid-tempo, Doom-y song “Wolflord”. The material is restrained and focused, there are some songs that I enjoy, but some songs don’t do too much for me. Lots of the material has its old-school charm, but can be a bit rudimentary at times. What I like is the variety of songs on the album – some fast and Thrashy, and some heavy, groovy, mid-tempo ones. Fans of primitive, caveman-ish, old-school Metal – the Hells Headbangers kind of stuff – will find much of the album enjoyable.